I was swimming in IoT heaven yesterday - but I just had to mention this kit! 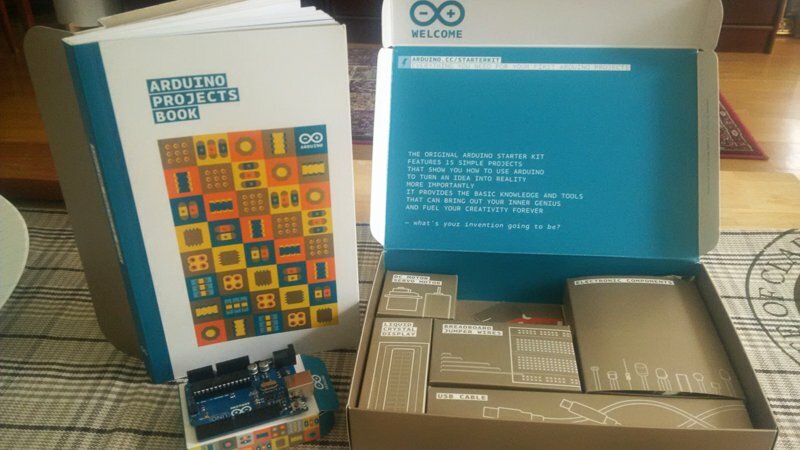 Anyone who wants to tinker around with the idea of IoT and get some foundations under their belts needs to look at the Arduino Starter Kit (official kit available from Arduino) which retails for around $100 USD. amazon.com is one place to get it; but so many other retailers are distributing it as well - they have done a good job of making it available to all. The kit comes with a bunch of electronics and is designed to walk you step by step through 15 unique projects that expose you to the IDE, C++ language, hardware concepts and the ability to really get your hands dirty without having to think it is rocket science. It is definitely the best option for those willing to get started with sensors and embedded solutions. The kit has over 200 electronic bits and pieces and the things you can do with it is not limited to the 15 mini projects that they outline piece by piece in the 170 page booklet. I can already imagine some cool little projects I could put together with all these bits and pieces. To make it even more interesting there is a massive community focused around the arduino project; and a bunch of interesting "kickstarter" projects that are aimed at extending the possibilities of the platform. It is possible to obtain "shields" that extend the capabilities of the core arduino platform - such as WiFi, ethernet, low-energy Bluetooth but that is only the tip of the iceberg. An unofficial list of shields are available on shieldlist.org. I think this is a great starting point for anyone who wants to tinker - what are you going to do with your arduino starter kit? I will definitely keep myself occupied with this little kit for a while - there is nothing like the gratification about creating something from scratch! need assistance in an IoT project? contact us for a free consultation. Welcome to my Internet of Things (IoT) blog! All comments are generated by users and moderated for inappropriateness periodically.